I often get asked where are the best places to have coffee in Portland. I used to think I was a coffee snob and knew a little bit about coffee before I moved here. Let me tell you – Portland’s coffee geeks have humbled me. That aside, here are the places I have tried and liked so far. This place is right near my house. I love the vintage science classroom decor and the super cute hip girls working there. Their coffee is delicious. They roast in-house & sell their beans too. Order a Latte or a crazy Japanese Siphon coffee. These guys are real coffee geeks. Probably the geekiest in the city. They take their coffee very, very seriously. They invented their own (reusable! sustainable! local!) metal cone for pour over coffee and they won the most recent NW Regional Barista Competition. They share a space with a (sustainable! local!) bamboo flooring company. How Portland. How can I not mention Stumptown? Stumptown is the largest(?) roaster in Portland and is the default coffee bean at most shops which don’t already roast their own. They have a few coffee shops in the city and sell their beans in the grocery stores too. This one on Belmont has two shops – one regular coffee shop and one “tasting room” called the Annex where they do free tasting flights of single origin beans every day at noon and 2pm. No joke. These guys make a great espresso. Try any of their espresso-based drinks. They’re always nice inside too. They have a really beautiful shop up on Alberta but I read on the news that it got pretty damaged by a fire caused by the 4th of July fireworks last week. No word when it’ll re-open. Sad. In the meantime, go support their Pearl District location. **EDIT** They’ve re-opened the Alberta location as of November 7th, 2011. 1725 NE Alberta Street. Café Vélo makes single-origin bean pour overs at the Saturday Farmers’ Market at PSU. Their stall is a bicycle. One of the best pour overs in town. Don’t be intimidated by their menu – just ask them to recommend a bean. Order the pour over – have them recommend one ** Only open on Saturdays! I am in love with Courier. It’s teeny tiny and right nearby Powell’s. There’s two guys who I always see work there, and I swear they must wake & bake every morning. They’re sweet and can tell you about the origin of every ingredient in every item in their store. Everything is hand-made (including the hand-written menus). They roast their own coffee & deliver beans by bicycle. 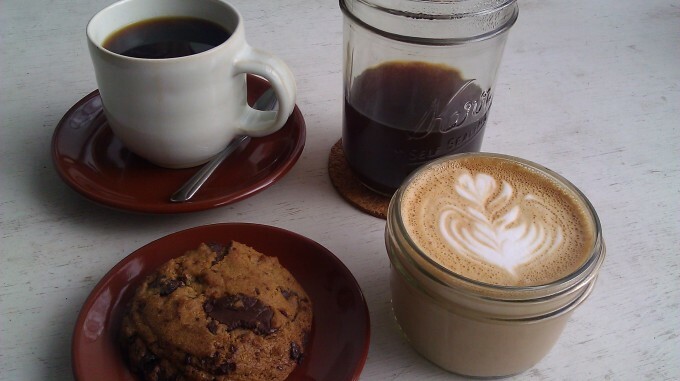 If you have time for only one coffee shop in the West side – go here. I’m sure I’m forgetting some people’s favorites. If your favorite coffee isn’t listed here – there’s a chance I haven’t tried it yet. Let me know and I’ll check it out. One Response to Best Coffee in Portland? You make me want to try some of these! Yum.